No few times one can hear that hydrocarbons nationalization in Bolivia generated a big amount of money, that all of the Bolivian economic boom is due to this measure. In fact, the comparison between the "neoliberal" past and the "blessed" present is an everyday food, especially when the Government inaugurate a public good or when official workers deliver gifts to the people. For this reason, in this opportunity I want to clarify some "details" that are not mentioned, but make a big difference. First let's see how the "official" data, regarding the state money coming from the oil industry, is usually presented. 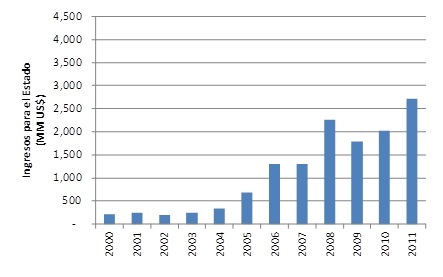 The following figure shows that fiscal income (in millions of U.S. dollars) for the period 2000-2011, it's clear the significant increase from 2006. So it is not new that such figures lead to a discursive ecstasy, before the oil sector contributions hardly reached 300 million U.S. $, now exceed U.S. $ 2,500 million ... what an apotheosis! What is not said, repeat ... not said or mentioned, or compare, or take into account is the size of the "cake" during this period, that is, the total gross receipts from exploitation of oil and natural gas in Bolivia (measured in Wellhead). A comparison between the past and present regardless of the "size of the pie" is so biased but at the same time so "magical" that I need an example to explain my point. You are a lucky person, you have health, education, a beautiful family and a good job, where the salary is enough to have a peacefully life. As a good citizen, you pay your taxes regularly according to your labor income, because is a normal salary, tax payments are reasonably good. Now imagine that life smiles, life takes a turn and an uncle, little remembered, heritages you a great fortune... a really great fortune. You, after the initial shock, don't believe how lucky person you are and now, with your family are planning the new life (many will say that now your life will be more complicated, but I leave it for another day). The truth is that now that you're a millionaire, you must also pay more taxes ... the IRS does not forgive you. In this sense, would it be correct to say that before you pay low taxes because, to say the least, you were a bad citizen? Would it not be better to compare the payment of your taxes regarding your income? Well, the answer to the last question gives us the justification to compare the tax payment with the size of the cake, because, if not, the comparison will be so biased. That's why I invite you to see the following figure, it not only shows the total tax payment, also (through the red line) also shows the size of the cake. Ok... here things start to make more sense, let's see, in 2000 the "cake" was 500 million U.S. dollars, of which 220 million "went to the state". Moreover, by 2011 the size of the cake was 3,900 million, of which 2,700 are "were for the state." Making the analogy, during the first half of the last decade, the oil industry in Bolivia was the person of the modest salary that I mentioned in the previous paragraph, but since 2006, Bolivia receives "inheritance" of millionaire uncle, which in fact comes in the form of: 1) higher international oil prices and, 2) natural gas export contract to Brazil. Once we understand that the fiscal revenues in Bolivia respond to bigger a "cake", it is also useful to introduce colors to the chart ... the colors of Nationalization. Again it's now fair to put one color in all the fiscal revenues from the oil sector. So I present the following figure, in it we see that the fiscal oil contributions from the oil sector are from: 1) royalties 2) the hydrocarbons direct tax (IDH), and 3) nationalization revenues (in green). 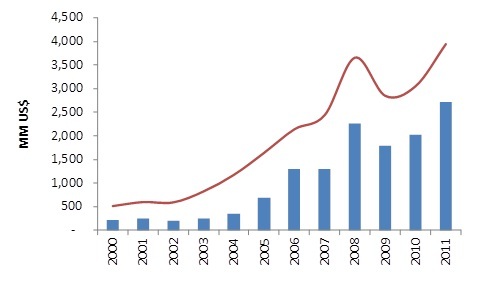 If we look carefully we can note that a big part of tax revenues comes from IDH (red area), tax created in 2005 ... yes! one year before nationalization! This week I had many meetings "in the downtown" of La Paz, so I left my cave and walked the streets of my beautiful city. Many people enter, leave, sell, buy, claiming ... live! looking this people I wondered how many of them are interested in these things? Nationalization, international prices, export to Brazil, taxes? ... they are ultimately interested in "that they have money in their pockets" and are happy with it. Sadly I went back to my bubble and I started writing this blog, thinking, perhaps, in my existence.